A remarkable masterpiece in an excellent state of conservation, the painting will become one of the icons of the Museo del Prado. This acquisition has been completed with the personal donation by the Duke of Alba, Carlos Fitz-James Stuart y Martínez de Irujo, of another important panel that has recently been researched at the Prado and can now also be attributed to Fra Angelico. 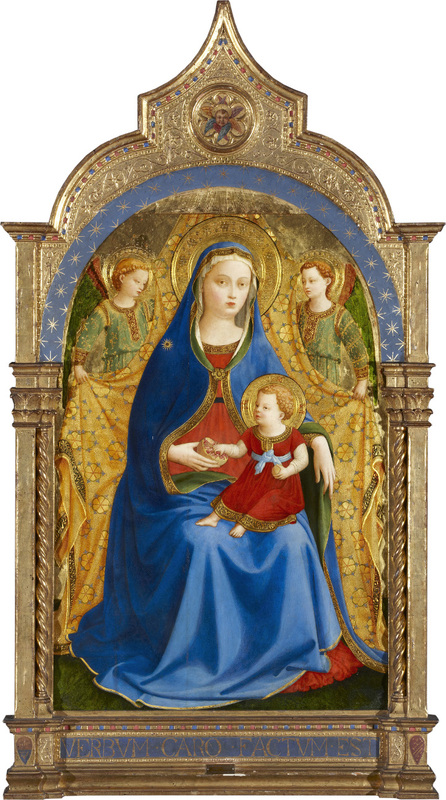 The Royal Board of Trustees of the Museo del Prado and with the Minister of Education, Culture and Sport, Iñigo Méndez de Vigo, also in attendance, today approved the acquisition of The Virgin of the Pomegranate, the only masterpiece of early 15th-century Florentine painting and the only masterpiece by Fra Angelico to remain in private hands. The payment of this 18 million Euro acquisition over the next four years will be funded by a special contribution of 10 million Euros from the State, an exceptional contribution of 4 million Euros from the Fundación Amigos del Museo del Prado, and another 4 million from the Museum’s own funds. At the same meeting it was also decided to accept the offer made by Carlos Fitz-James Stuart y Martínez de Irujo, 19th Duke of Alba de Tormes, to donate another important Florentine work, a predella panel on the subject of the death of Saint Anthony Abbot, which has recently also been attributed to Fra Angelico following a study of the work at the Museum. The two paintings, both acquired in Florence in 1817, represent an example of the sophisticated and early collecting interests of Carlos Miguel Fitz-James Stuart y Silva, 14th Duke of Alba, who acquired the works and had them sent to Spain where they entered the Alba ducal collection. With the addition of these two new works by Fra Angelico, the Museo del Prado will become an international reference point for the study of this Florentine master, who was previously only represented in the collection by The Annunciation. These two further works enormously enrich the Museum’s small but outstanding group of paintings by this early Italian Renaissance painter. In acknowledgement of the Duke’s admirable gesture of only offering this remarkable masterpiece to the Museo del Prado and the generosity of the donation that completes its acquisition, the Museum’s Royal Board of Trustees has proposed that he should be made an honorary trustee. The present Duke of Alba is responsible for the administration of the House of Alba and is president of its Foundation. He is also honorary vice-president of the Fundación Hispania Nostra, of which he was president from 1976 to 1980, which devotes its activities to safeguarding and promoting knowledge of the Spanish cultural and natural heritage. The Virgin of the Pomegranate is a remarkable work painted at one of the key moments in the history of European art, in early 15th-century Florence, by one of its most important artists: Guido di Pietro (Mugello, 1390 - Rome, 1455), better known as the Beato Angelico or Fra Angelico. This panel is also one of the very few masterpieces of this period to remain in private hands, given that since Quattrocento Italian painting first began to attract the attention of critics and art lovers in the early 19th century, it became a coveted field for museums and collectors. In the present day the most important works by Masaccio, Masolino and Fra Angelico are housed in the leading European and American museums. This fact, in addition to the painting’s fine state of conservation, makes The Virgin of the Pomegranate exceptionally important. Guido di Pietro da Mugello must have trained with Lorenzo Monaco (active between 1390 and 1423), the principal painter and illuminator in Florence, and in fact Fra Angelico’s first activities were as an illuminator. By 1418 he was an independent master and between that date and 1422 he entered the Dominican monastery of San Domenico in Fiesole. Most of his output from that point onwards was associated with the Dominicans, starting with the monastery in Fiesole for which he painted The Annunciation now in the Museo del Prado (1425-1426), among other works. It reveals the influence on the artist of Masaccio’s volumetric and perspectival innovations. This is also the case with The Virgin of the Pomegranate, which has traditionally been dated just after the Prado Annunciation and which reveals clear echoes of Masaccio’s Sant’Anna Metterza altarpiece for the church of Sant’Ambrogio (1423-1424). The Virgin of the Pomegranate is one of a series of Virgin and Child compositions that Fra Angelico painted in the 1420s and which reveal his increasing mastery of anatomy, light and space. This group also includes The Virgin of Humility in the Museo Thyssen. The Virgin of the Pomegranate takes its name from the pomegranate held by the Virgin and which attracts the attention of the Christ Child, who touches it. In this context the fruit has a double meaning: in the Virgin’s hands it refers to her chastity, while by touching it the Christ Child prefigures his own death and resurrection. This iconography was widely used in 15th-century Florence where it interested artists such as Sandro Botticelli and Leonardo da Vinci. It is not known for whom The Virgin of the Pomegranate was painted but it can be said that this was an exceptional commission given the outstanding quality of the materials used. Particularly striking is the abundance of gold, not just in the visible areas such as the textile hanging behind the figures but also as the base for the grass-covered ground on which they are located. It could be considered paradoxical that Spain, in which there was traditionally very little interest in Florentine art of the early Renaissance, possesses two of the first works by Fra Angelico to leave Italy: the Museo del Prado had The Annunciation, which was given by Mario Farnese to the Duke of Lerma as early as 1611, while the Alba collection possessed The Virgin of the Pomegranate, acquired in Florence in 1817 by Carlos Miguel Fitz-James Stuart y Silva, 14th Duke of Alba de Tormes (1774-1835). The difference lies in the fact that while it is doubtful that The Annunciation arrived in Spain because of any appreciation of the artist, but rather for its association with the Annunciation, a favoured subject of devotion at that date both in Florence and Madrid, The Virgin of the Pomegranate represents a very early example of interest in Fra Angelico in Europe, in which the Duke’s advanced tastes in art and his relationship with artists such as Ingres was decisive. The Virgin of the Pomegranate left Italy too soon for the art historians who were beginning to focus on Fra Angelico to turn their attention to it. In addition, the fact that it has remained relatively inaccessible in a private collection and in a country with few examples of early Tuscan Renaissance painting has also meant that it has been little known. Nonetheless, and particularly following its inclusion in the exhibition held in Florence in 1955 to mark the 500th anniversary of the painter’s death, it has been unanimously accepted as an autograph work by Fra Angelico by experts of the stature of Berenson, Salmi, Berti and Pope-Hennessy, who tended to date it to the 1430s, or, more plausibly, to the previous decade. Although exceptional, the Museo del Prado’s paintings collection has two significant gaps, which are the result of historical circumstances in the case of 17th-century Dutch painting and of changing tastes in collecting in the case of Italian painting prior to 1500. This second deficiency explains why, at the beginning of the 19th century when interest in the latter field began to grow, neither the recently created Museo del Prado nor Spanish private collectors could compete with their American and European counterparts in their acquisition. The Prado’s small collection of Italian painting from prior to 1500 (albeit one not devoid of masterpieces) largely entered the Museum in the 20th century with the bequest of Francesc Cambó. The present acquisition of The Virgin of the Pomegranate is a major event for any major art museum while for the Prado it also represents an enormous strengthening of its collection of early Renaissance Italian painting and the addition of a work that will become one of the icons of the collection. This is a panel from the predella of an altarpiece on the life of Saint Anthony Abbot, a monk and the founder of the eremitic movement. The panel has always been considered a work by the school or circle of Fra Angelico but following its recent study and restoration at the Museo del Prado it can now be attributed to the artist himself. The attribution can be made on the grounds of its notable technical, formal and compositional parallels with similar works attributed to the artist, in particular with The Funeral of Saint Francis of Assisi in the Berlin Gemäldegalerie. With regard to its dating, it seems appropriate to suggest a date close to that of The Virgin of the Pomegranate, in the late 1420s. No altarpiece on Saint Anthony Abbot by Fra Angelico is documented although there are depictions of that saint by the artist which may have belonged to one. Reference should be made to Saint Anthony Abbot shunning the Mass of Gold (Houston, Museum of Fine Arts), the dimensions of which (28.1 x 19.7 cm) are remarkably close to those of the present Funeral of Saint Anthony Abbot, suggesting that they both formed part of the same work. Carlos Miguel (Madrid, 1794 - Sion, 1835) is now universally acknowledged as the principal collector and art patron of the Alba family, having been the one to acquire many of the most important works in the family collections. A patron of the sculptors José Álvarez Cubero and Antonio Solá during his time in Italy, the Duke also commissioned paintings from the young Ingres and even acquired works for the intended opening of a gallery in Madrid that would be of use for the training of young artists. That project was not realised due to the financial problems that obliged the Duke to sell various works. Nonetheless, most of the collection has remained intact and with the family until the present day. In addition to the historical connection between the various titles of the Alba family and the formation of the Spanish royal collections, the present-day relationship with the Museo del Prado has been a fruitful and ongoing one over the course of the Museum’s history, primarily due to the richness of the family’s collections. Many of its masterpieces have been loaned to the Museum for temporary exhibitions while some have completed the permanent collection in the form of long-term loans. Worthy of separate mention is the fact that the principal works from the Alba collection, including The Virgin of the Pomegranate, were sent together with other masterpieces of Spanish cultural heritage and with the principal works from the Prado to Geneva during the Spanish Civil War. On their return to Spain and during the time the Liria palace was being rebuilt, The Virgin of the Pomegranate remained on display at the Museum. Finally, and of particular significance today, is the fact that the first president of the Museum’s Royal Board of Trustees was Jacobo Fitz-James Stuart y Falcó (Madrid, 1878 - Lausanne, 1953), 17th Duke of Alba. Appointed a member of the Museum’s Board of Trustees in 1912, he held the position of president until the Board was disbanded in 1936. In 1939, with the creation of a new Board following the Civil War, he was again appointed a member. The Duke had the initial idea of establishing a Society of Friends of the Museo del Prado and embarked on its creation, although the project was not completed until after his term as president had ended. On his death the Duke bequeathed a sum of money to the Museum that enabled it to acquire a work by Paret y Alcázar.